RUSH: Well! Look at this. Roy Moore is up by five points down in Alabama. 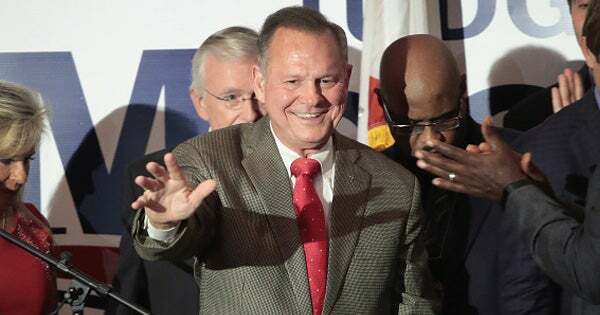 “A poll released by Change Research late Monday shows that” Roy Moore leads “Doug Jones by five points… According to the poll, ‘Alabama Republican Roy Moore has reopened a 49-44 lead over Democrat Doug Jones in the race for U.S. Senate. In Change Research’s third poll since the sexual misconduct allegations against Moore first surfaced on November 9, we found that he has completely erased the three-point lead Jones had opened up in mid-November. Moore’s lead is now just as large as it was just after the story broke. This is from the poll: “‘Compared to 10 days ago, fewer Republicans believe the allegations against Moore,’ Change Research noted.” Can you say “backlash”? Can you say this has been so over the top? It’s 40 years ago, and I think Alabama Republicans are recognizing here that there is a concerted effort between local Alabama Democrats and national Drive-By Media, and they’re simply standing up to it. So the media may end up being its own worst enemy in this circumstance. We’ll have to see.